GBP/USD is back down, failing to take advantage of the Brexit chaos weighs. Eight days to go, there are three scenarios left. The technical picture is worsening for the pair which is nearing oversold territory. GBP/USD is trading back below 1.3200 as the Brexit uncertainty continues. On Wednesday, UK PM Theresa May officially asked for an extension to Article 50, to June 30th. She opted for a short delay of Brexit that would more time for Parliament to pass the Brexit deal. In a defiant speech to the nation, May blamed MPs for not doing their duty and approving Brexit. Such approval, in the third Meaningful Vote (MV3), remains highly unlikely. The second vote was defeated by a broad margin of 149 MPs. The Northern Irish DUP reiterated its rejected to the deal, which its MP Sammy Wilson called “toxic.” Also, House Speaker John Bercow refused to allow a repeat vote on the same exact deal. In Brussels, EU Council President Donald Tusk said the EU would likely approve the short extension, pending a positive outcome in London. But now, the EU will reportedly approve a shorter Brexit extension that will end on May 22nd or 23rd, just before the European Parliament elections on May 26th, complicating matters. May will meet her 27 EU counterparts for a summit in the Belgian capital today. The heads of states are unlikely to sign off the extension but rather wait for Parliament to pass the accord. These recent developments mean that Brexit goes down to the wire. Everything will be decided in the last days before March 29th, Brexit Day. There are currently three scenarios for the ultimate end game. If hard Brexiteers in May’s Conservative Party and the DUP prefer to go for what they see as a bad Brexit than losing it altogether, she may miraculously muster a majority. The vote itself would require some procedural hacking and convincing Bercow to allow it to move forward. In this scenario, Parliament gives the green light on Tuesday or Wednesday, with the EU Council approving an extension on Thursday. The UK leaves the EU with a deal in May or in June. GBP/USD has room to rise quite a bit, as this would be a mostly positive outcome and would provide certainty. If the EU does not grant an extension and Parliament does not approve the deal, the UK may accidentally leave without an agreement. Such a “Brexident” is the default option that nobody wants. In this scenario, GBP/USD has plenty of room to the downside, with a potential plunge to 1.2000. Things may be resolved later on, but the immediate reaction may be pure panic. European Council President Donald Tusk said that a short continuation is contingent on Parliament approving the deal. But if Parliament doesn’t do that, there will be no short extension, but perhaps a longer one will work? May hinted that she would quit if a longer extension is approved. Under a new government, Brexit can be renegotiated, but that will take time, more than three two or three months. The EU initially thought of 9-12 months. As mentioned in other articles, markets dislike uncertainty but hate Brexit. It could turn into a buying opportunity on GBP/USD that could go as high as 1.4000. Apart from Brexit, UK retail sales slightly beat expectations with 0.4% and the Bank of Englandis set to leave its policy unchanged, waiting for Brexit, like everybody else. On Wednesday, GBP/USD temporarily too advantage of the USD’s fall on the dovish Fed decision. The technical picture has worsened for GBP/USD. Momentum turned negative on the four-hour chart. Besides, cable fell below the 50 Simple Moving Average. The Relative Strength Index is leaning lower but remains above 30, thus not pointing to oversold conditions. However, it is getting close. Support awaits at the recent low of 1.3120. 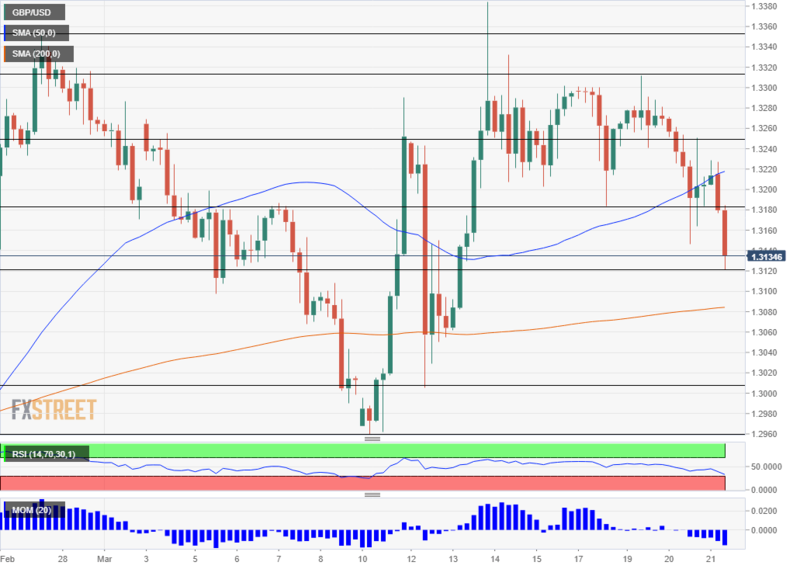 Further down, 1.3080 is where the 200 SMA meets the price. 1.3010 was a swing low last week, and 1.2960 is a double bottom. 1.3180 was a swing low earlier this week. It is followed by 1.3250 that was a temporary high after the Fed, and 1.3310 which was a high point earlier in the week.